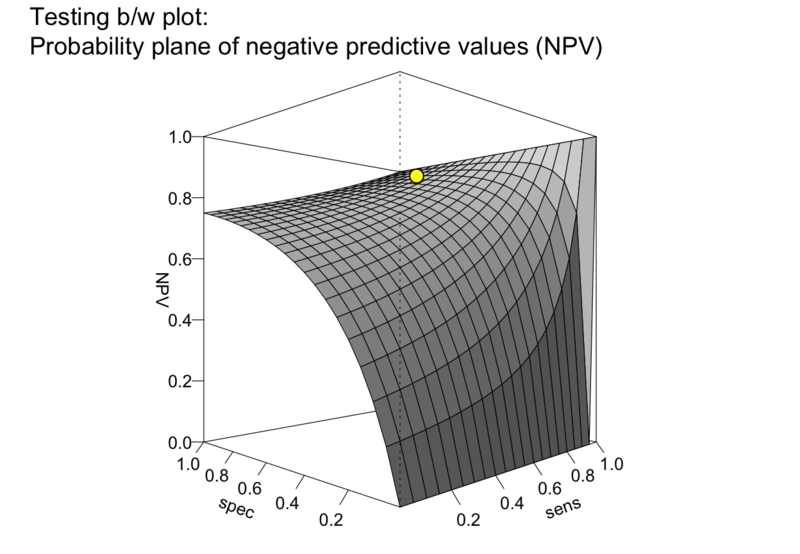 Plot a plane of selected values (e.g., PPV or NPV) as a function of sensitivity and specificity. 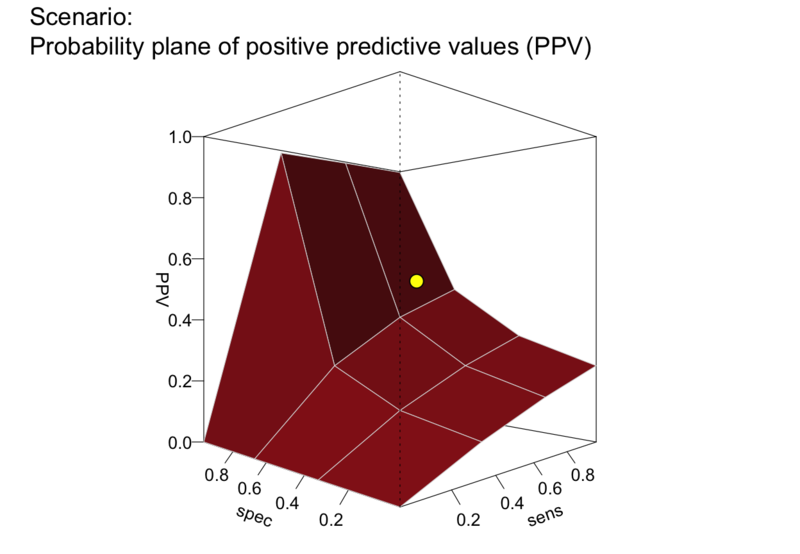 plot_plane draws a 3D-plane of selected values (e.g., predictive values PPV or NPV) as a function of a decision's sensitivity sens and specificity value spec for a given prevalence (prev). 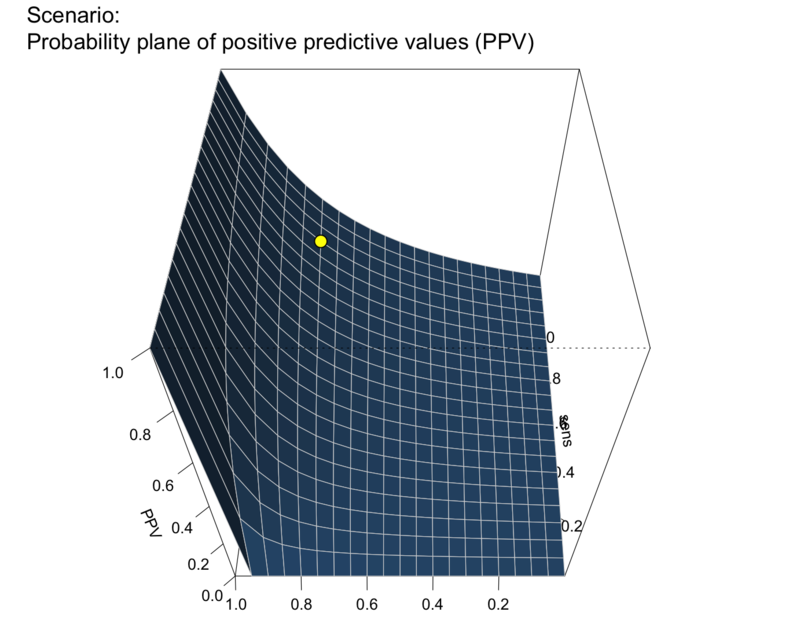 The decision's sensitivity sens (i.e., the conditional probability of a positive decision provided that the condition is TRUE). sens is optional when its complement mirt is provided. If sens = NA, then show_points = FALSE. 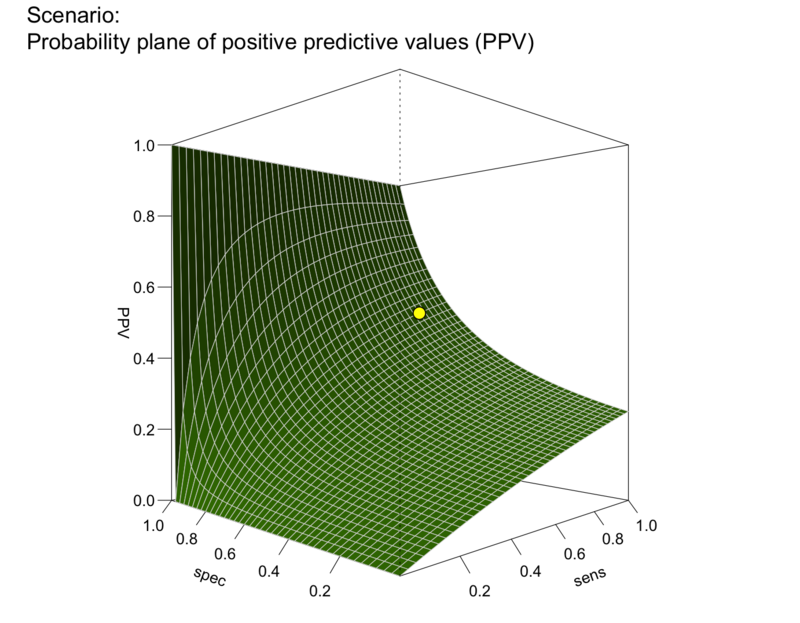 The decision's specificity value spec (i.e., the conditional probability of a negative decision provided that the condition is FALSE). spec is optional when its complement fart is provided. If spec = NA, then show_points = FALSE. 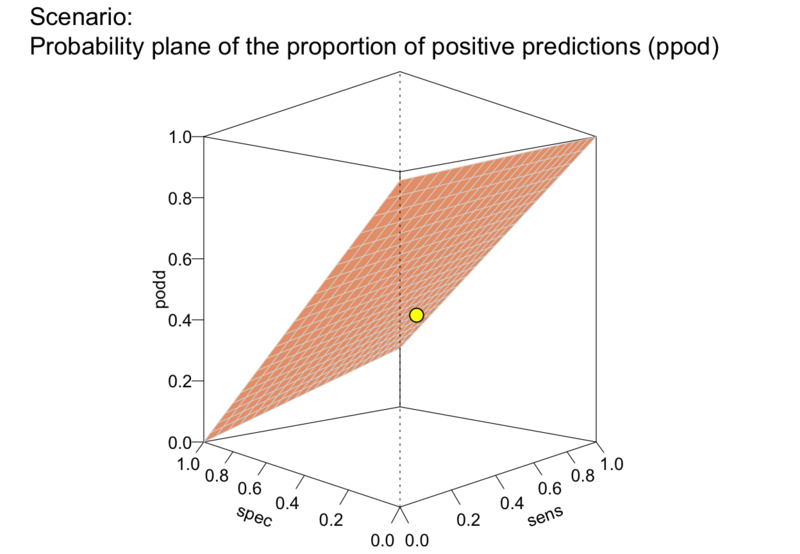 A character code that specifies one metric to be plotted as a plane. Currently available options are c("PPV", "NPV", "ppod", "acc"). Default: what = "PPV". Color for surface facets corresponding to the metric specified in what. Default: what_col uses color corresponding to what in current col_pal. Color for lines between surface facets. Default: line_col = "grey85". Range (minimum and maximum) of sens values on x-axis (i.e., values in c(0, 1) range). Default: sens_range = c(0, 1). 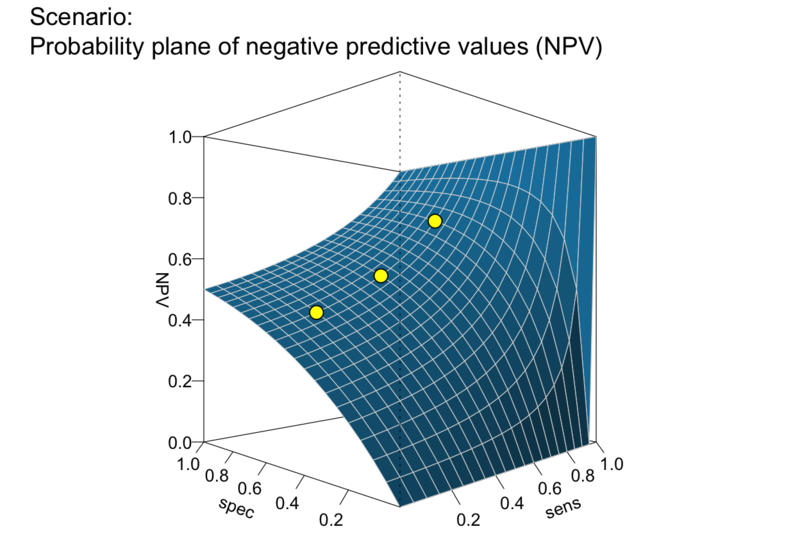 Range (minimum and maximum) of spec values on y-axis (i.e., values in c(0, 1) range). Default: spec_range = c(0, 1). 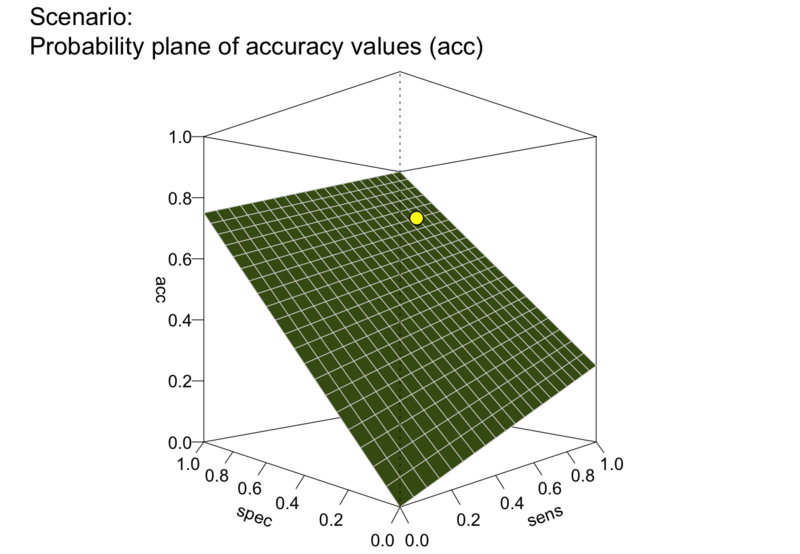 Sets the granularity of the sens-by-spec grid. (in range .01 <= step_size <= 1). Default: step_size = .05. 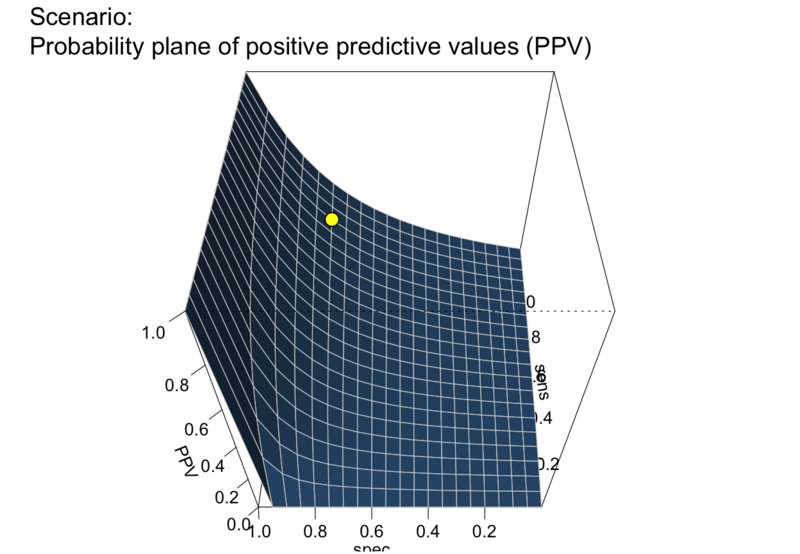 Boolean option for showing the current value of the selected metric for the current conditions (prev, sens, spec) as a point on the plane. Default: show_points = TRUE. Fill color for showing current value on plane. Default: point_col = "yellow". Horizontal rotation angle (used by persp). Default: theta = -45. Vertical rotation angle (used by persp). 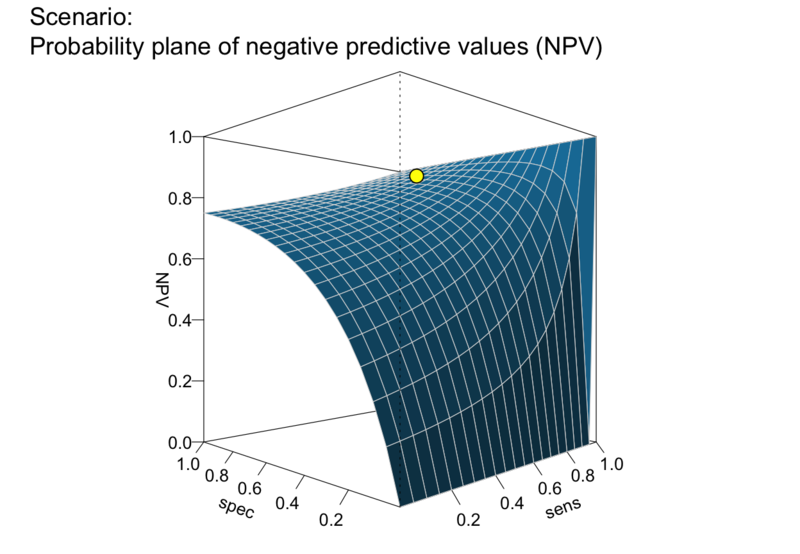 Default: phi = 0. Labels and text elements. Default: lbl_txt = txt. Main plot title. Default: title_lbl = NA (using lbl_txt$scen_lbl). "no": hide labels (same for p_lbl = NA or NULL). Scaling factor for the size of text labels (e.g., on axes, legend, margin text). Default: cex_lbl = .85. Color palette (if what_col is unspecified). Default: col_pal = pal. Boolean value for showing margin notes. Default: mar_notes = TRUE. 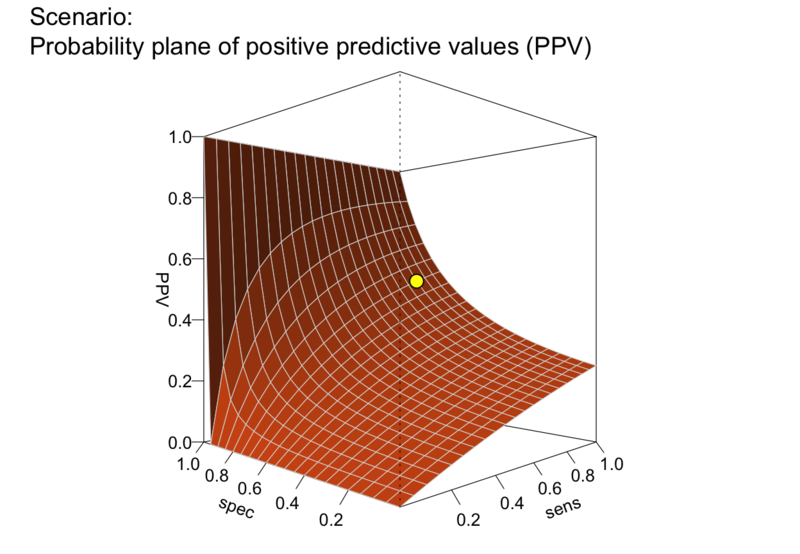 plot_plane is a generalization of plot_PV3d (see legacy code) that allows for additional dependent values. 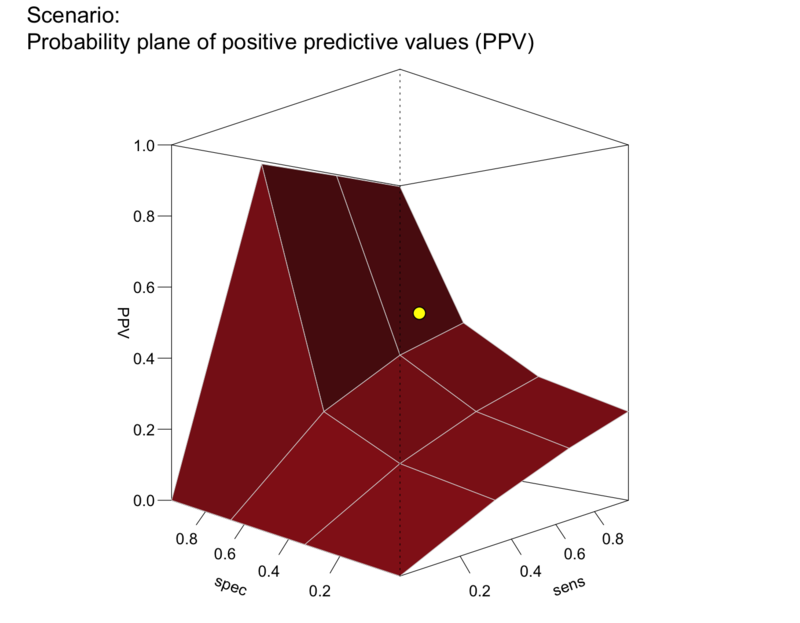 #> No sens or no spec value provided: Plotting plane without points. 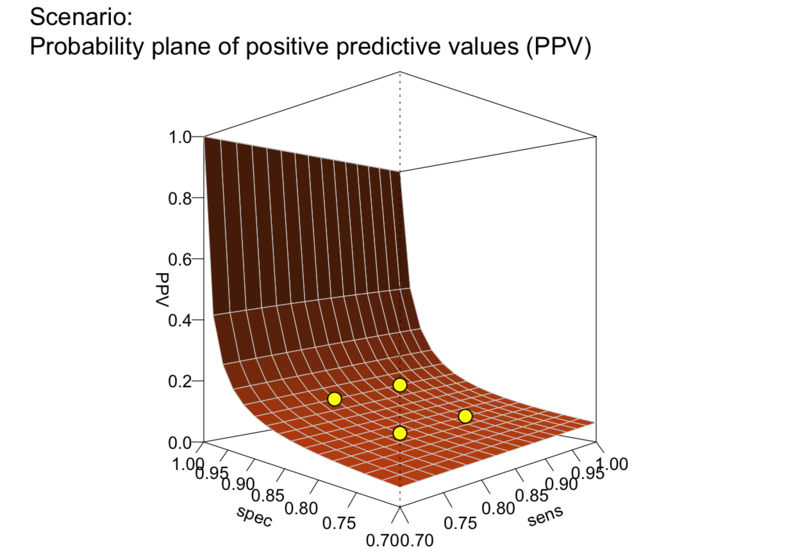 #> Multiple sens/spec values provided: Plotting multiple points on plane.